Tracks are sometimes labeled with a grade. 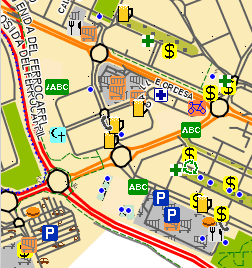 I can find definitions of the grades on the OpenStreetMap Wiki. However, sometimes there is also additional information in brackets, e.g. Grade2 (3 M). What do these additional annotations mean? Occasionally it will be labeled as (2.0m M), which I take it means a width of 2 metres. But what does the capital M signify? What does the number indicate? The numbers in brackets means width in meters: X M. M should be lower case, but Garmin software capitelizes it. Widths should be introduced in OSM database without units, but if someone add an "m" then you'll see a double "m" in the map. Looking at Garmin line legends. how does one (say) distinguish a sealed/paved vs unsealed secondary road? Currently there's no way to distinguish them. In most places a secondary road is supposed to be paved, but I know that's not true in all countries. Is there a way to reduce the detail clutter on the Australian map when using BaseCamp? In BaseCamp (as well as in MapSource) you can select several different levels of detail. You have to enable "Level of detail" toolbar under "View" menu.